Combining classic style with contemporary ergonomic design, the Mimi Brushed Steel Stool Cream offers you the best of both worlds. Lending your bar area a smart sense of luxury, the Mimi Brushed Steel Stool will become your favourite furniture item. Filled with high-density foam, the mid-height backrest offers great support without taking up too much room, perfect for any space. Plus, the cream faux leather upholstery lends this stool a cool, modern edge. For great versatility, the brushed steel frame incorporates a gas-lift and swivel function, and a footrest provides additional support. The Mimi features a traditional rounded base with a protective underside, designed to help to keep your floors looking fabulous. "Great product great service would recommend"
Very good quality, and very well packed next day delivery. Also the website gives very clear dimensions of the stools which was very important due to space in kitchen. Brilliant - would recommend. The company and product are both great! 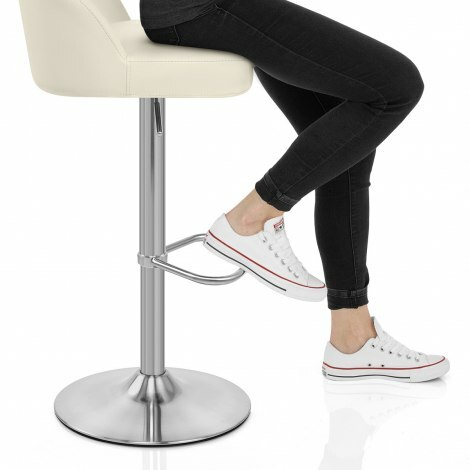 Next day free delivery and a good price for the stools, plus the option to easily return if necessary. All in all we're thrilled to bits and will certainly recommend. In fact, we bought on the recommendation of a neighbour! Cannot fault the process at all. Thank you. I ordered 3 barstools from the Atlantic website in April for my new kitchen. I chose the Mimi brushed steel stools in cream. They arrived next day, really well packaged. Instructions were good: my 18 year old daughter assembled all three within 30 minutes or so including the unwrapping time! The website was simple to use and the order process very efficient. The choice is incredible. The stools are very good quality and, cosmetically look really good. 5 months later I decided I wanted a forth stool to match but couldn't remember the exact model so I rang and spoke to an incredibly pleasant young lady. She looked up my previous order, checked the model details and advised that they couldn't guarantee the dye colour would be the same batch but if I was unhappy I could return. All my details were on file so the order process again was simple and efficient. The stool arrived the next day and is perfect. I would recommend Atlantic to anyone. Excellent product, service and staff.